In June 2015, Mars will swing almost directly behind the sun from Earth’s perspective, and this celestial geometry will lead to diminished communications with spacecraft at Mars. The arrangement of the sun between Earth and Mars is called Mars solar conjunction. It occurs about every 26 months as the two planets travel in their sun-centered orbits. The sun disrupts radio communications between the planets during the conjunction period. To prevent spacecraft at Mars from receiving garbled commands that could be misinterpreted or even harmful, the operators of Mars orbiters and rovers temporarily stop sending any commands. The teams running NASA’s three active Mars orbiters and two Mars rovers will refrain from sending commands to their spacecraft from about June 7 to June 21. 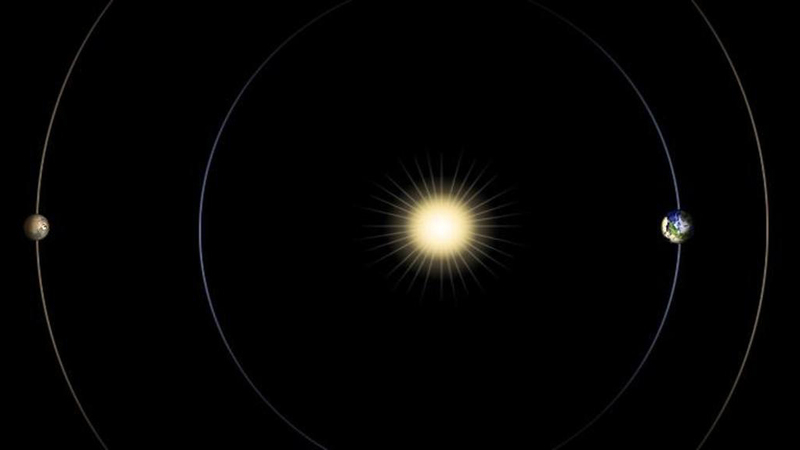 During that period, the sun will be within two degrees of Mars in Earth’s sky. (Don’t try to look, though, because looking at the sun is dangerous to the eyes.) The operators also will put restrictions on commanding — such as using only reduced data rates or communicating only in an emergency — during the days before and after that period. Spacecraft will continue making some science observations during the conjunction period, though rovers will not do any driving or arm movements. This diagram illustrates the positions of Mars, Earth and the Sun during a period that occurs approximately every 26 months, when Mars passes almost directly behind the Sun from Earth’s perspective. Image Credit: NASA/JPL-Caltech. This entry was posted in Mission News and tagged conjunction, Curiosity, Mars, Mars Exploration Rover, Mars Odyssey, Mars Reconnaissance Orbiter, Mars Science Laboratory, MAVEN, mission, MRO, NASA, Opportunity, orbiter, rover, spacecraft on 2015-06-05 by Heather Dalton.